A quiet getaway—complete with fresh air, scenic cliffs, and friendly locals—a visit to the charming small town of Fort Davis, Texas is good for the soul. Today the town rallies around community activities such as Texas six-man football, but the town's beginnings included military construction, army drill, and defense against raiding Apache, Comanche, and Kiowa. On October 23, 1854, Bvt. Major General Persifor F. Smith issued orders establishing Fort Davis, named for Secretary of War Jefferson Davis, in the Trans-Pecos region of west Texas. A key post in the defense system of west Texas for almost half a century, the fort played a major role in the history of the Southwest. From 1854 until 1891, troops stationed here protected emigrants, freighters, mail coaches, and travelers on the San Antonio-El Paso Road. Fort Davis National Historic Site, situated on the northern edge of town, is one of the best remaining examples of a frontier military post. It is a vivid reminder of the significant role played by the military in the settlement and development of the western frontier. Upon arrival guests are greeted at the visitor center, housed in one of the restored enlisted men's barracks, where they are treated to a quick introduction to the fort's history. Visitors have access to the museum, and in the former mess hall turned auditorium, can watch a 15-minute film narrated by Kareem Abdul-Jabbar. Following a self-guided tour, visitors can wander the grounds at their own pace, stopping at a number of buildings where they might meet characters from the 1800s. 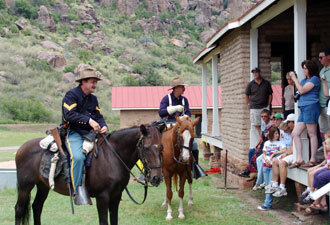 A Buffalo Soldier at the restored barracks regales visitors with stories of the fort’s past. An officer's wife or servant can often be found at the commanding officer's quarters across the parade grounds, sharing an inside look into the fully-furnished home of Col. Benjamin Grierson and his family. Visitors can test their knowledge of frontier medicine with the Wheel of Misfortune at the newly restored post hospital or explore the frontier diet at the post commissary. Have kids? At Fort Davis children who complete the Junior Ranger program can earn a unique Fort Davis badge or patch. Beyond the exhibits, Fort Davis National Historic Site maintains several trails for both avid hikers and individuals who simply wish to share a victory cry atop the mountain outlook. Shaded picnic areas are available where visitors can dine amongst the historic oaks and perhaps catch a glimpse of the wildlife at the park. Summer events at the fort range from 1880s baseball games to small arms and artillery-firing demonstrations. In autumn, the park hosts a lantern-led night tour. 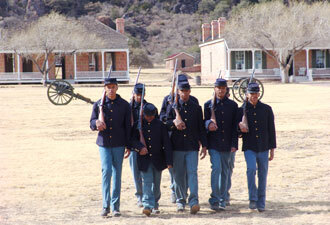 Whether you're a history sponge or a nature enthusiast, Fort Davis is full of adventure. 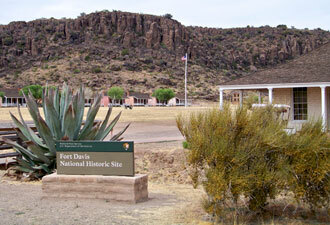 Fort Davis National Historic Site can be reached from north or south via Texas highways 17 and 118 and from the west via Texas highways 505, 166 and 17. The park is open daily from 8 am to 5 pm central time. Visit our website at www.nps.gov/foda for more information regarding holiday hours, special events, and field trip activities.